Are you looking for places to stay near Silverwood? We have vacation rentals near Silverwood Theme Park for large and small groups. From 2 to 22 people, we can accommodate any size group or family. 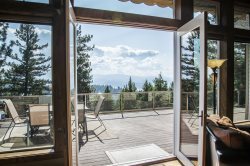 Follow this link to find lodging near Silverwood Theme Park or request help finding a home that suits your specific needs by contacting an expert at Vacation Rental Authority. Coeur d'Alene vacations make incredible family memories and they are waiting for you all year. Come visit us today. We have incredible places to stay near Silverwood, with huge homes with plenty of room for extended family or friends. Our Silverwood Lodging packages make finding lodging and tickets easy. 1 call does it all. We can do much more than that with our full concierge service so if you are looking for a worry free, full service vacation and Silverwood adventure than call now. Just call 800-679-3661 and speak with Cheryl or Robert to find the perfect vacation rental for your Silverwood vacation. Discount tickets to Silverwood Theme Park and Boulder Beach. When you reserve your vacation rental with Vacation Rental Authority, you qualify for a FREE promo code so you can get great discounts on Silverwood Theme Park passes. No limits.